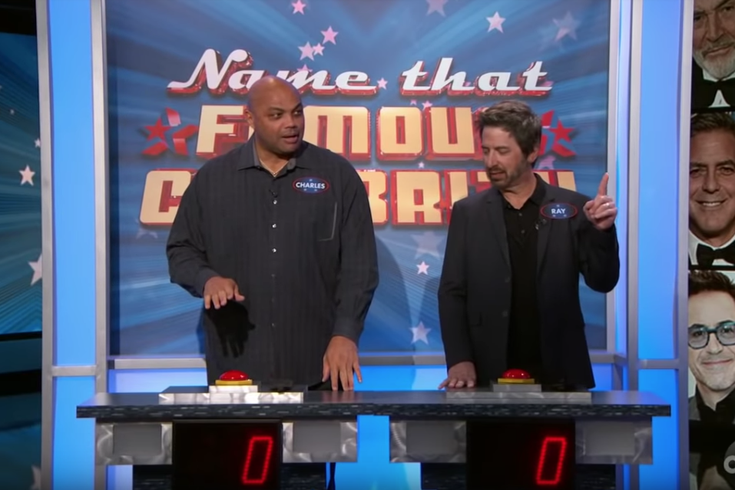 Charles Barkley competes with Ray Romano in "Name That Famous Celebrity." Former 76er, Charles Barkley, appeared on "Jimmy Kimmel Live!" Tuesday night and talked about the NBA, Bill Belichick, and even squared off with comedic actor Ray Romano in "Name That Famous Celebrity." Barkley talks about Shaq, explaining some of the things he says with a shake of his head, "This is a guy I work with," Barkley said, adding, "Hey, listen, I love the guy, but he's no rocket scientist." During the interview, Barkley underscored his dislike for super teams in the NBA. "I think sports are about competition. You just do the best you can and you live with the ramifications. But what happens is I don't think it's fair for small market teams." He adds, "I just want competitive balance." But apparently, the former Philadelphian has a bit of a crush on one of the most hated men in Philadelphia. Barkley ends his appearance by competing with Ray Romano in “Name That Famous Celebrity," a game where Kimmel's friend, celebrity-obsessed Yehya, describes celebrities to the two contestants as they wear blindfolds. It was quite the close game, but Yehya's description of Ariana Grande as a "young girl with hair" kind of threw the players off. Watch Charles Barkley full appearance below.